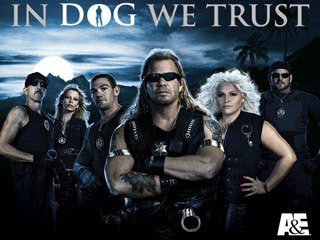 A recent conversation between my husband and I after I have been watching all of the episodes of "Dog The Bounty Hunter". ME: Hey Curt?! What would you think about me quiting my job to become...wait for it...a BOUNTY HUNTER. ME: Why not? I think I would be so good at it. ME: Really? You don't think I would, like, totally rock at catching bad guys? ME: Hmmm...you can make a lot of money doing it. ME: Well, how about we think about. I think it could work out.